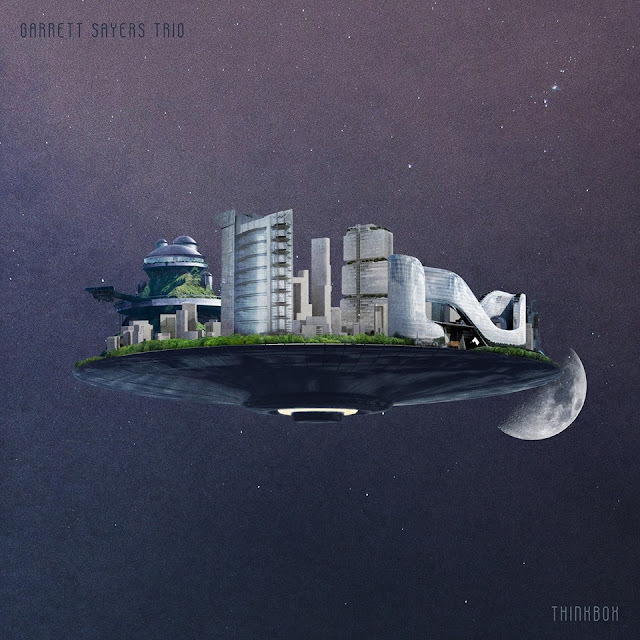 Years after its conception, Garrett Sayers Trio has grown in to its full potential with Thinkbox. An intellectual masterpiece through and through, the album features a massive sound from three premier players; Garrett Sayers, Patrick Lee and Jonny Jyemo! Combining aspects of Jazz, Fusion, Hip-Hop and organic Electronic Music, Thinkbox is a cornucopia of sounds layered thick like a musical onion, that when chopped up leaves the listener with an earful to digest. What begins as just another day in the universe, "Beat Car" opens up into beauty at every turn as the trio tactfully assembles an other-worldly canvas. "Diatribe," a track that used to be called "Diatribe Girls," conjures up imagery of a boisterous conversation. The track is highlighted by Patrick's melody and Jonny's tonal work on layers of percussion and may be my favorite off of the album. The title track, "Thinkbox," feels like a sort of transcendence through the stratosphere with electronic effects entering the picture as Earth disappears in the rear-view for seven plus minutes of auditory bliss. The exploratory "Counterclock" follows with menacing musical vibes as the vehicle dodges asteroids of predictability and instead opts for orbit on a trail yet blazed. Jyemo's machine-like consistency coupled with Sayers' deep pocket make for one of the most in-tune rhythm sections this side of Orion's belt. The listener is brought back to Earth with the J. Dilla classic "Go Hard," and a fan favorite of the GS3 covers. Lee's key strikes and embellishments coupled with the forward-moving bass progressions create a force to be reckoned with on the track. "LuvRoot" boasts a World Music vibe and increased percussion courtesy of Jyemo along with a heavy collective output from the trio as it prepares for re-entry. The upbeat "Hankus" signals an orbital exit and furious and fiery notation as ground control goes dark under the intensity of Garrett's song ending solo. An electronic groove called "Jacked" drops a barrage of low end notes that is sure to scramble the brain for the duration of the short track. The album resolves with a spirited return to Earth in "Mrs. Lee," a feel good tune from the protagonists for the population as a whole. Thinkbox is one of the most brilliantly executed albums that I have heard in some time. It's accessible, yet pushes the envelope on genre-bending compositions that are both imaginative and captivating. The trio avoids vocals and instead opts for the universal language of music. What these three humans manage to output on this Earth-made product may take an orchestra of robots in the future. Give this album a spin in its entirety and experience the tactical precision that makes Thinkbox the incredible masterpiece that it is. It's Radiohead. It's J. Dilla. It's Garrett Sayers Trio. It's music. It's beautiful.